It has been very hot lately. In return, I became very "hardworking". Instead of leaving the plates on the table after finished eating, I put them into the kitchen sink. I even asked Mamarazzi to let me help to wash the plates. 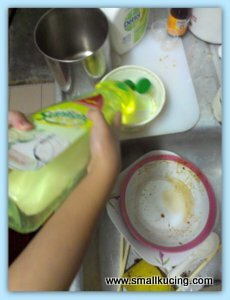 First pour some dish washing liquid into the bowl. Then dip the sponge into the bowl. Make sure have to wash both sides wor. But Mamarazzi won't let me wash the pots and pans yet coz its too heavy and dirty for me. Aiyor!!!! Kesian!!!! Child abuse!!! Come, come...uncle adopt you, will do it all for you. LOL!!! 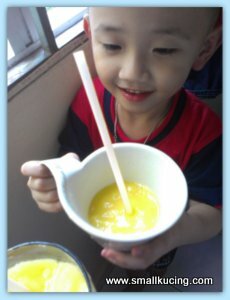 I made mango smoothie ytd.not nice leh...mind to share recipe? 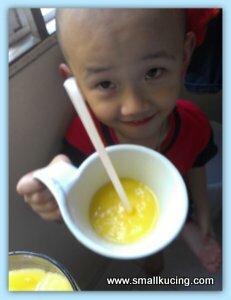 wah, mamarazzi knows how to make mango smoothies ah?? so "geng" one?? never share out the recipe geh?? must teach us how to make it till small kucing loves it so much cuci pinggan also no problem.. haha!! 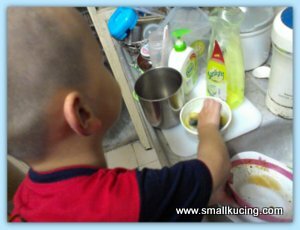 good boy, starting to help mommy with the washing up.. can slowly train him lah, and hope this is not just "hangat hangat tahi ayam".. haha!! my nephews in primary school already, still leave their plates and bowls and cups conveniently on the table.. never even bother to bring to the sink.. I love mango smoothie esp now that the weather is a killer. Great to see you little one helping out a bit and this is a good habit. 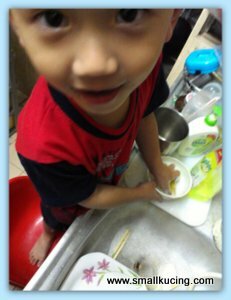 Helping mamarazzi to wash dishes cos no money to pay for the food you ate? Hahaha! 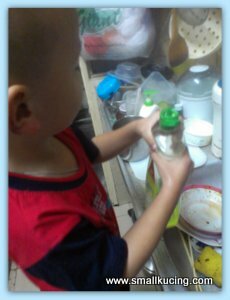 Chloe also likes to wash dishes cos she gets to play with water (but her mummy won't let her put detergent).